Album Quilt made by Margaret English Wood Dodge in Brooklyn. 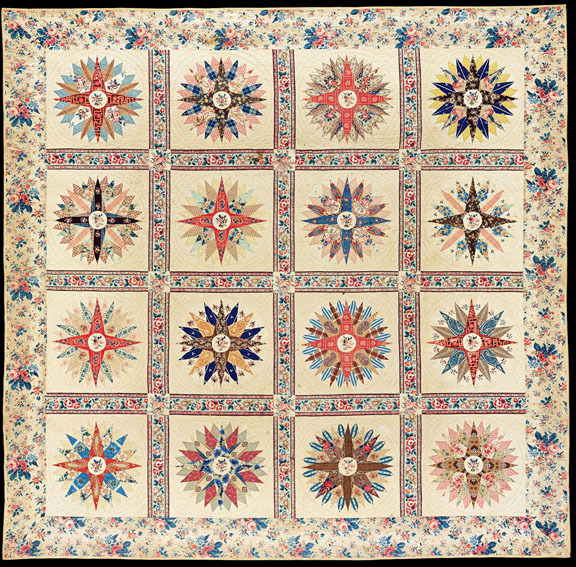 I have recently been working on patterns for a quilt inspired by one made by a Margaret Dodge of Brooklyn. 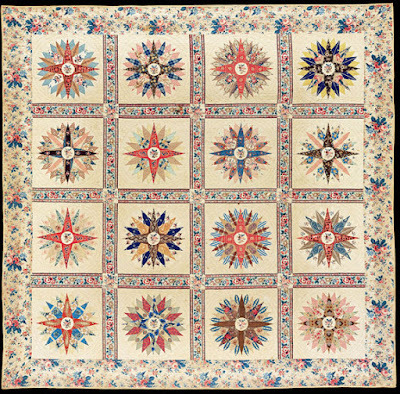 You may have made my Dixie Diary block-of-the-month quilt in 2013, which owes a lot to this Margaret's blocks. Particularly in the star and heart appliques. 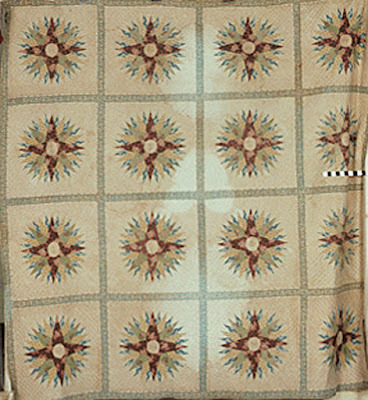 Another fussy-cut paisley in the Colonial Williamsburg quilt. 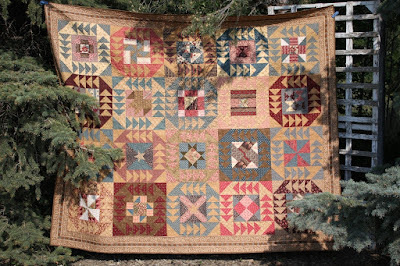 Margaret's album is charming and Margaret made a lot of quilts, but I cannot believe she also made the masterpiece quilt at the top of the post. It's just not her style. There must have been two Margaret Dodges in Brooklyn and indeed there were. Margaret English Wood Dodge (1783-1873) was the grandmother of Margaret Dodge Marschalk Sutton (1826-1907). They probably have known each other well as the elder Margaret lived until the younger one was in her sixties. 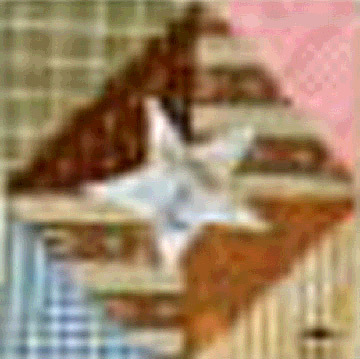 The link between the two Margarets is Clarissa Mary Dodge Marschalk (1803-1838) daughter of one and mother to the other. Clarissa died when her daughter Margaret was about 12 years old. The younger Margaret's father Girard Steddiford Marschalk (1801-1827) had died when she was a baby. Who raised her? Fussy-cut paisley from the Mariner's Compass quilt. But perhaps granddaughter Margaret didn't make this Mariner's Compass. There's a curious detail at the end of the cataloging information online. 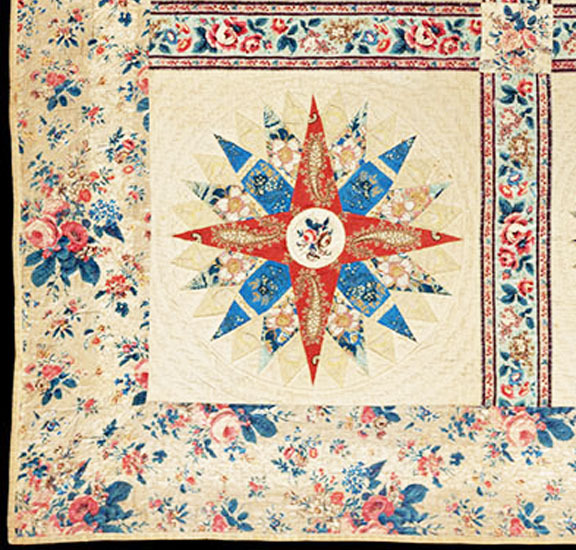 "The quilt descended from the maker Margaret Dodge Marschalk Sutton (1826-1907) to her daughter Louise Marschalk Sutton (b. 1871). The quilt descended through Louise to a great-grandson of Margaret's, Robert W. Pitt, who donated it to the museum. 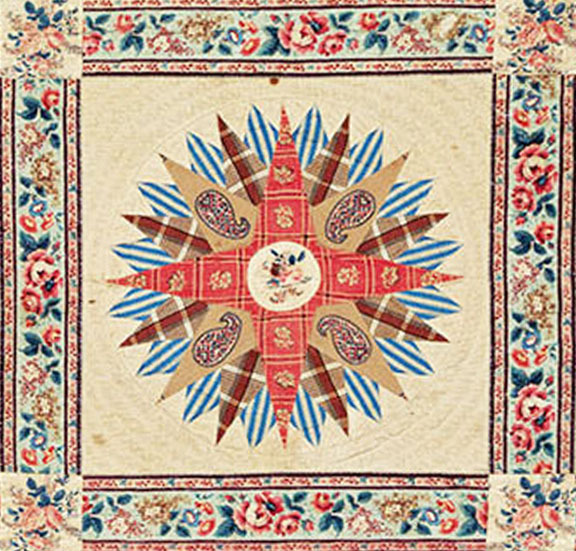 Mark(s):A printed calling card for Mrs. Louise Marschalk Chapman was pinned to the quilt when the object was acquired; the reverse of the card bears the ink script inscription 'Designed and made/one hundred years/ago by Clarissa Dodge/Marschalk and left/to/Louise Marschalk Chapman.' 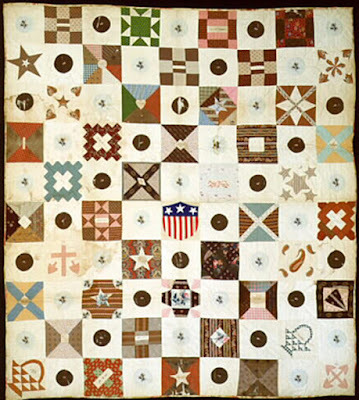 "
Why did the family believe that Margaret Sutton made the quilt when the card from Margaret Sutton's daughter indicated that Clarissa Marschalk stitched it? Clarissa died in 1838. Could this quilt have been made by her before 1838? 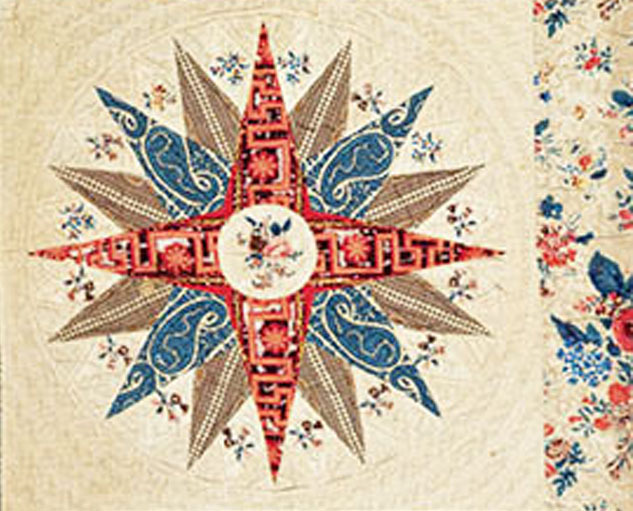 There were certainly Mariner's Compass quilts being made in the 1830s. 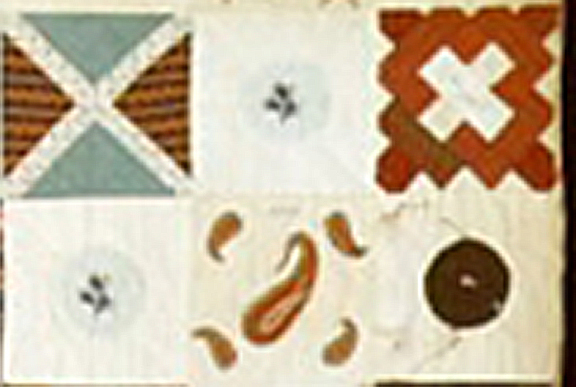 Quilt date-inscribed 1831 from the North Carolina project and the Quilt Index. The Turkey red and Prussian blue blocks in the Dodge quilt are more typical of the 1840s but the chintz sashing and borders were classic 1830s style. a Flying Geese design. Pretty spectacular. See this listing to buy the paper patterns. 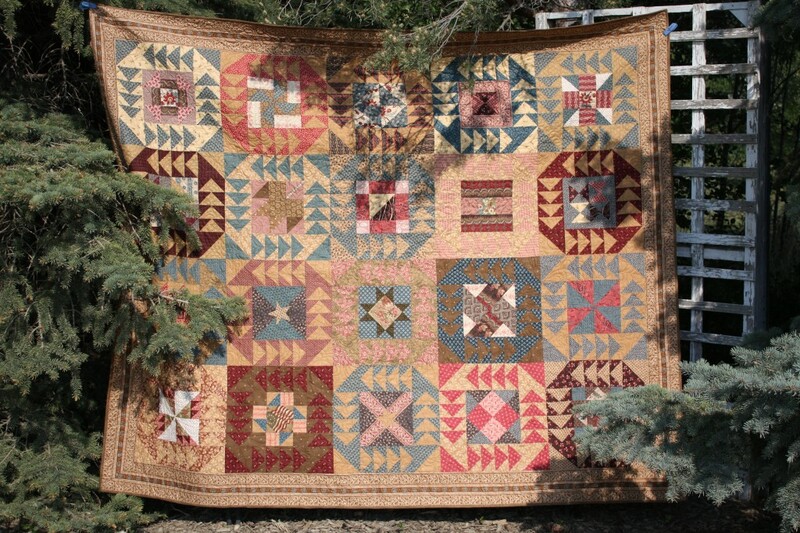 It's a great quilt Carol. 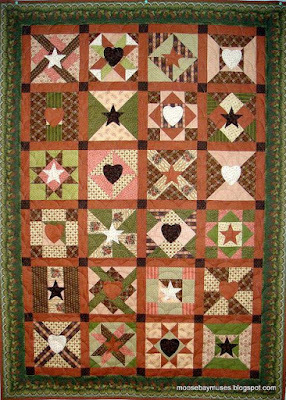 The sashing completely changes the simple blocks. Very interesting post. I agree that there must have been more than one Margaret Dodge in Brooklin. Dodge's are thick on the ground around here. My paternal grandmother, Achsa May Dodge Caton had a cousin named Margaret Dodge. I think she lived in Palmyra, Maine.